Lindberg's musical career began in earnest in the prestigious St. Eriks Boys Choir in Stockholm, which he credits for steering him away from hooliganism, and where he was lured by Mozart and Mendelssohn's Hear My Prayer—in which he sang solo. Lindberg's dictum of imposing flexibility and prying open creative possibilities—even in the stiff upper-lipped world of classical music—where creative restraint holds sway under the stern stare of tradition, can be applicable to other creative enterprises, context and genre notwithstanding. In our discourse, we shall address the short story. 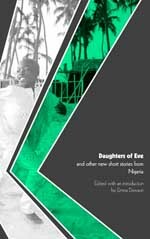 Daughters of Eve and other new short stories from Nigeria, a recent anthology of short stories from Nigerian, edited by Dr Emma Dawson, and published by CCC Press as part of its Fiction series, is an example of how artists, or in this case writers, attempt to compress experiences—often complex and universes into the confined world of the short story. But it is also a study of how different writers from relatively the same socio-economic and political landscape can take a perspective, utilizing the raw materials of a particular discipline, apply it to the creative medium and emerge with mixed results. So what do the writers in this collection do with the short story? Some of them draw a familiar and not-so-familiar caricatures of a society in distress—perhaps rightfully so—that has inhabited global news headlines and transnational debates; a society in which aspects of its own fabric continue to be in conflict with its contemporaneous realities—case in point, Uchechukwu Peter Umezuriki's Fragile, a story of discovery, taboo, envy, lesbianism, and the indomitable and lingering presence of death. According to Chinua Achebe, the short story is a medium where prose could be utilized in a poetic manner, and where sound, rhythm, image, symbol, tone and point of view can be meshed to convey not only plot but the physical and emotional. Fragile, one of the most ambitious of the tales in the collection encapsulates this feature of the genre. It is verses like this in Fragile that animate the reader as they join the narrator in her sojourn of self discovery and doubt, a journey which illuminates, as the title reveals, the sheer fragility of the human experience. Umezuriki's tale is interspersed with terse stanzas that reveal a dark cloud, looming in the backdrop, as the characters pose existential questions. It is tales like Fragile, despites its minimal shortcomings that capture the complexity of human nature. But then again, the Nigeria that emerges from these pages is a conundrum of arbitrariness and injustice. It is a sphere where fulfillment is found in the perverse and hope is a distant oasis. And even though the title story, Peter Ike Amadi's Daughters of Eve—a fast paced tale about the most grotesque aspects of Nigeria, or any society for that matter, a narrative that possesses the immediacy required of the short story, it, like some other stories in this collection opt for melodrama over nuance. Jamuke Verissimo's Lightless Room is a stellar, and I dare say refreshing example, of how the writer can play the role of architect and engineer, but above all, as eye, ear, and voice to the unseen, unheard and unspoken. Verissimo's creative impulses manifest themselves through a room, its colors, stench, occupant, visitor, and its being. She decided she wouldn't care about the darkness in the room anymore, or the changes he had had over the years. She leaned against the chair, and heard the droning of his metallic voice, but not his talk. It is pastels like this from Lightless Room that tell the story of a voice silenced and an aspiration extinguished. A silence that is both deep and mystical. It tells the story of a Nigeria that is complex—ugly and beautiful, insane yet wise. It is a story that personifies the meaningfulness and salient truths that Cortazar envisions. However, not all the stories in Daughters of Eve and other short stories from Nigeria possess the vigor and freshness of Verisimo's Lightless Room. Readers familiar with 'postcolonial' literature—in whatever guise it might take—will find some of the themes here too familiar; there is the returnee/JJC whining about his native country; there is the Kafkaesque criminal justice system; there is the conspiratorial mother, and there is love, betrayal and tragedy. Then, there are few editorial oversights that puncture potentially strong stories like Guitar Boy, where the names of characters get muddled in mid-narrative [Paulina?] to the annoyance of the attentive reader. It is a collection with a realistic streak with occasional dots of the fantastic. Some of the writers featured here, the prolific Tolu Ogunlesi (No Woman Left Behind) comes to mind—still in the dawn of their craft—but who already exhibit an astuteness and discipline that promises a bountiful tomorrow for the letters in Nigeria. In a nutshell, this collection is a glimpse, at least from a particular perch, of individuals in a society in the thralls of cultural hybridism as its negotiates its tomorrow from the bounty and embers of its yesterday and today.